Picks the lips until they bleed. Corners of mouth sore and cracked and bleeding. Fever blisters, especially in intermittent fever. Deep crack in the middle of lower lip, upper lip. Vesicles like pearls on lips. Lips and corners of mouth dry, ulcerated and cracked. Lips dry, chapped, cracked or excoriated and ulcerated with scabs and burning and smarting eruption. Vesicles in internal surface of upper lip, with burning. Lips bluish or black, dry and chapped. Lips excoriated with a sensation of tingling. Swelling and bleeding of the lips. Induration and swelling of the lips with shooting in rough weather. Deep redness and dryness of the lips. Pimples, scabs and ulcers with red circular margin on the lips and in the corner of the mouth. Lips parched, dry, cracked, as if burnt, wants to moisten them. Burning of lower lip in old smokers, lips swollen, dry, black and cracked. Upper lip and nose swollen, red and hot. Lips swollen and cracked with bleeding and sensation of burning on being touched. Eruptions on the lips with burning, smarting. Cramps like sensation in the lips. 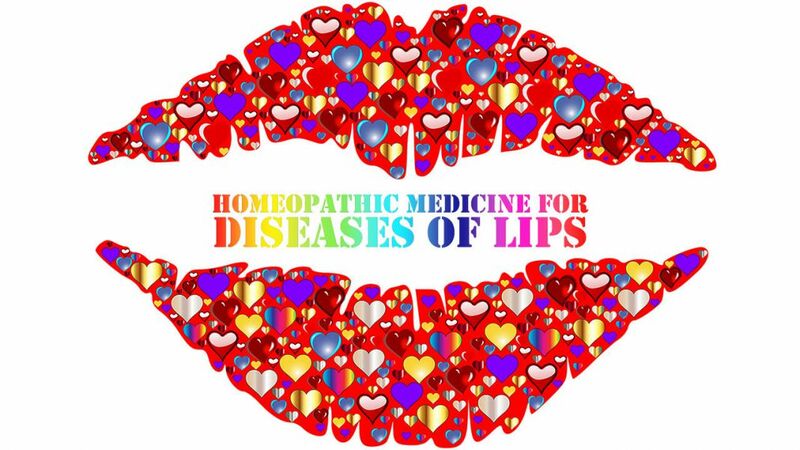 Ulcers on the inner surface of the lips. Fissure in the ulcerated lips. Ulcerated, corner of the mouth lips cracked. Lips became shiny and painful and burning soreness. Lips swollen, dry, scaly externally. Excoriation and burning in lips and commissures. Lips swollen and cracked with exfoliation. Swelling of lower lip with rhagades. Upper lip ulcerated with burning pain when touched. Corner of mouth raw, cracked or scabby. Lips swollen and itching cracked. Swelling of upper lip, very painful to touch. Aphthous patches on inside of lips and cheeks and on the tongue. Ulcers in corners of the mouth. Ulceration at the commissure of the lips.